To a blender, add the coconut milk, cashew butter, cocoa powder, honey and salt. Blend until pureed and smooth. Transfer to popsicles molds and add popsicle sticks. Freeze for at least 5 hours, ideally overnight. 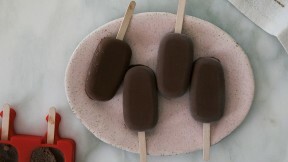 Gently remove popsicles from their mold.